The Pyle PPHP127AI PA Loudspeaker is the ultimate high-powered cabinet system. It comes loaded with features including an impressive 1200 watt power output, 12'' subwoofer, 30-pin iPod dock, USB flash drive reader, SD memory card reader and plenty more to add full-ranged, distortion-free sound where you need it! Just plug it in and you're ready to play your favorite MP3 digital audio files. Connect your iPod into the built-in 30 pin dock -- or insert a USB flash drive or SD memory card loaded with music from your computer's media library. It pushes everything from pounding bass to a chirpy high-end, that creates wide-coverage two-way sound from this versatile, all-in-one amplified cabinet. Connect a microphone, instrument, amplifier, computer, MP3 player, additional speaker and more. This PA speaker comes equipped with XLR combo (microphone) input, XLR 3-pin input, RCA line input, XLR line output and 1/4'' line outputs. You will be able to accommodate multiple microphones and any electronic instrument simultaneously. Then, control it all with independent rotary controls from the speaker's control center located on the back of the unit. Customize your audio and make it sound just the way you want with bass and treble controls, and use the 3-channel mixer to perfect the balance between your iPod, mic, and audio input. Located on the bottom of the housing is a 35mm pole mount socket and tightening tension knob for securing the system in a multitude of applications. It's Ideal for bands and DJs serving as the main audio amplification system, so you can rock the audiences indoors or out. 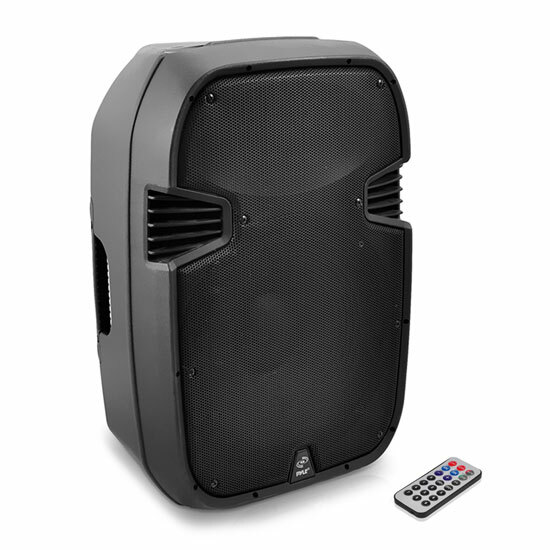 Whether you are at home, in the yard, on the stage or at the club, the Pyle PPHP127AI PA Speaker System will make it loud for the crowd! how do you hook your iphone 7 up to this speaker?